admin June 15, 2014 Comments Off on Cash In: EBITDA? Spend any time researching business transactions and you will quickly run across the phrase, “EBITDA.” Well, what is it? 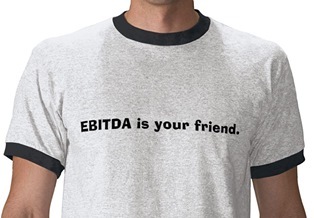 EBITDA is “Earnings before Interest, Taxes, Depreciation and Amortization.” What’s so special about that? Theory is if you look at a business’ earnings and EXCLUDE these items, you may more accurate compare one business’s core earnings versus another. Consider two companies ingeniously named Company A and Company B. Interest: Owners of Company A were flush and purchased their business for all cash. Company B owners weren’t. Instead they got a sizable bank loan. Today, Company B’s earnings are less than Company A because they pay interest expense and Company A does not. In order to compare “core” earnings between the two companies, income taxes are thus disregarded. And by that we mean they are added BACK to net income. Taxes: Company A is a C Corporation and thus pays corporate income taxes on net income. Company B is an S Corporation does not because it is a pass-through entity meaning the net income is “passed through” to the owners of the stock who then declare the income on their personal tax returns. So one pays corporate income tax, the other doesn’t. Therefore, in order to make earnings between the two companies comparable, interest expense is disregarded and any corporate income tax expense is added BACK to net income. Depreciation: Company A buys equipment and pays cash for it and takes Section 179 accelerated depreciation to the maximum. That means their depreciation expense isn’t spread evenly over the years; rather is higher in years when the equipment was put into service. Company B borrows money to buy equipment and thus does NOT accelerate their depreciation (a good move). So depreciation expense in Company A is erratic from year to year while depreciation expense in Company B is smoother. Again, in order to make “core” earnings between the two companies comparable, depreciation expense is disregarded by adding it BACK to net income. Amortization: the difference between depreciation and amortization is that hard assets are depreciated (equipment, building, vehicles) while soft assets (franchise fees, goodwill, organizational costs) are amortized. Otherwise, the concept between the two is the same and therefore amortization is disregarded for the same reason depreciation is; because its treatment between two entities can cause core earnings to vary widely. So, amortization is also added back to net income. When we take two companies and add back to net earnings expenses of Interest, Taxes, Depreciation and Amortization; we then have comparable core net incomes without the influence of the owner’s financial strength or lack of it. In short, we are down to core earnings provided by the business. In general, EBITDA is a useful measure for comparing larger companies with significant assets, and/or significant amounts of debt. In smaller businesses like ours, Owner’s Compensation (salary) can be an issue with using the EBITDA measurement for it is sometimes overstated or understated at will by the owners who happen to also be management. As you can see in the EBITDA formula, Owner’s Compensation (salary) is deducted for the purpose of calculating Net Income. That’s not an issue for larger corporations (think stock exchange businesses) in that they have professional (hired) management and the expense would be similar regardless of who owns the business. In smaller businesses like ours, Owner’s Compensation sometimes is over or understated. So, often when comparing smaller businesses, ONE owner’s salary is removed. Thus while EBITDA is a common measurement of business values, attention must be paid to the Owner’s Salary issue in comparing two smaller companies. And that’s the reason that all methods of earnings measurement are used, not just one. Small business values based on EBITDA is often in the 2.5 to 3.5 range or two and one-half to three and one-half year’s core earnings. Where it falls on the range is based on a number of other factors which we have previously covered such as sales growth, probability of maintaining earnings, location in growing or shrinking markets, stale or booming product lines, equipment adequacy, age of employees (probability of all retiring soon) and more. We do provide on-site valuations of businesses that include an estimate of value as well as include recommendations of “fixes” that will improve earnings and thus value if there are issues there. We also can provide a non-onsite arms’ length estimate of value for planning purposes for businesses if not in need of fixes. These are particularly valuable for owners with three, five or even ten year time horizons. 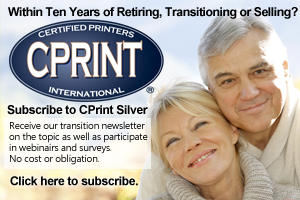 If you are ready, then email me at tom@cprint.com and let’s see where you are. Do you want to transition to son/daughter or employee? Fine, does the son/daughter or employee have the knowledge to “run” a business? This is particularly important for many times an “internal” transition requires the seller to finance all or part of the sale. So, you need to assure that you will get paid in your golden years and not have to come back and run the business. The way to do that is to assure your successor is trained. Our CPrint program has helped many prepare successors for business over the years.